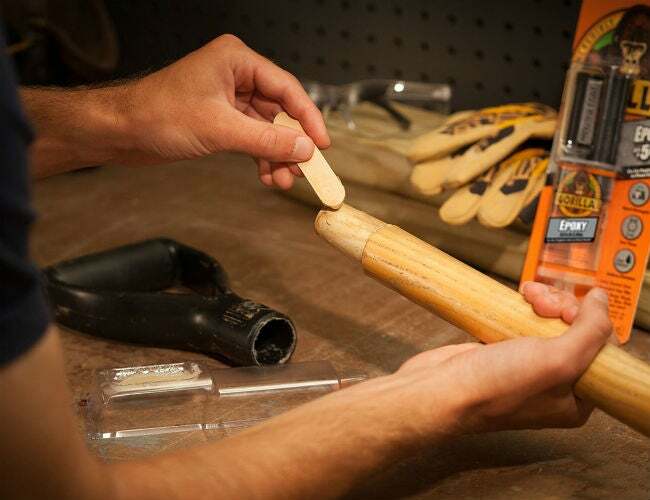 Free yourself from a sticky situation with these easy tips for removing epoxy resins. Epoxy is a heavy-duty bonding adhesive that comes in handy in many different repair projects, from fixing wobbly furniture to patching cracked floors. Depending on what you’re fixing up, you may choose a liquid variety or a putty comprised of two parts that harden when mixed. These chemically-hardening adhesives work wonders for tough projects but can really put you in a tough spot if they set in the wrong place. Fortunately, while the packaging may suggest that epoxy resins will harden anywhere from 60 seconds to several hours, many products take up to a day to fully cure—giving you plenty of time to remove unwanted drips or spillage. In order to avoid further damaging the epoxy-stained surface, it is important to find the right removal method for the type of material affected. This comprehensive guide will pair surfaces with solutions so that you always know how to remove epoxy in a flash. Keep reading to learn the tricks to undoing this seemingly-permanent glue. Wearing disposable gloves is a good first line of defense when working on an epoxy project, but accidents can happen. If you do get some epoxy on your skin, aim to remove it immediately before it cures. Soak a paper towel or cloth with vinegar and gently rub it on the affected area until the epoxy softens enough to peel off. No luck? Acetone, or acetone-based nail polish remover, can also be applied to a paper towel and used in the same way, but do so with care. It’s highly flammable and should be used in a well-ventilated area. Citrus-based waterless hand cleaners—commonly used for grease removal by mechanics—can also remove epoxy from your skin in a pinch (view example on Amazon). Pour some onto a cloth and scrub while rinsing under warm water. After the epoxy is removed, thoroughly wash the area and use hand lotion to soothe and heal your skin. Epoxy might provide a quick fix for repairing broken plastic pieces or sealing a cracked window pane, but it can be a pain to remove on such delicate surfaces. Simply soak a paper towel in isopropyl alcohol (rubbing alcohol) and rub it on the surface until the epoxy loosens. If the epoxy is still stubborn, a stronger solvent such as denatured alcohol (a solvent commonly used to fuel camping stoves) or paint thinner can also be applied to the area with a cloth to weaken the bond, and a scraper tool can be used to gently pry the epoxy from the surface. Once the epoxy is removed, use a clean, wet rag to remove any remaining solvents from the surface. Floor finishing with epoxy is a popular use of the product, but sometimes the resin can get in places it’s not supposed to go. 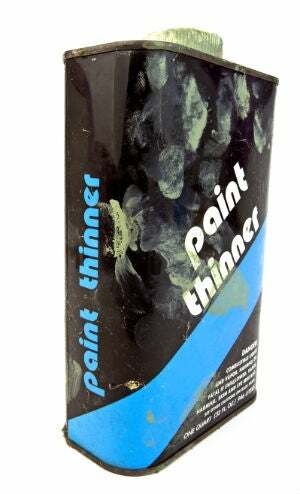 Avoid alcohol and paint thinners, which can damage or discolor wood finishes. Instead, enlist acetone for help removing epoxy on wood or concrete, as it can soak into the porous surface to surround and loosen the epoxy, making it easy to peel away. Leftover acetone, meanwhile, evaporates by air. Alternatively, heat can also be used to melt tough epoxy residues on wood, making it easy to scrape off. (Although, if you previously used any acetone on the wood, make sure it is fully evaporated before using this method—remember, acetone is highly flammable.) Pull on leather work gloves to protect your hands and hold a heat gun, set to about 200 degrees Fahrenheit, several inches above the affected area. Move the nozzle in small circles to heat the epoxy without burning the wood. Follow with a scraper while the epoxy drippings are still soft. Many of the removal techniques previously mentioned will also work on errant epoxy that dripped on metal or other hard, non-porous surfaces such as metal door jams or your favorite toolbox. Metal is tough enough to stand up to chemical adhesive removers, usually sold in hardware stores as sprays or liquids that are meant to be applied with a cloth (view example on Amazon). Be sure to wear gloves to protect your skin when using these chemicals, and carefully follow the manufacturer instructions. An aerosol can of spray refrigerant freezes tough epoxy, making it brittle and easy to chip away with a scraper. This, too, is a dangerous chemical; gear up with safety goggles, gloves, and a respirator to avoid coming into contact with the vapors, and only work in a well-ventilated area. Fabrics such as cotton and linen won’t be damaged by boiling water, but beware of melting synthetic fabrics or shrinking wool. For fabrics that cannot withstand heat, try rubbing or soaking vinegar on the epoxy to loosen it before washing in cool water.